I don’t usually stick a Dear Mark post in the middle of the week, but it’s not every day that I receive a barrage of questions on a single topic from dozens of insistent readers demanding answers. Immediately after yesterday’s launch of the 21-Day Total Body Transformation, I began receiving emails from hesitant readers. Some were PB diehards skeptical of the book’s value to them, others wanted it but needed some clarification before pulling the trigger. It was a wide range of questions I received, many of which overlapped with one another, so in today’s post I’ll do my best to collate, condense, and collapse them all into a few select questions that represent the general gist of yesterday’s emails. Hopefully it’s helpful for everyone. I’ve been Primal for a couple years now and have things pretty dialed in. Do I need this book? No. You don’t technically need it. If you’re Primal, content with your health, body composition, stress levels, performance, etc., and pretty much cruising along, you probably don’t need the book. However, anyone will still benefit from reading it, even the most diehard grub-eating, shoe-eschewing, gallon-of-tallow-rendering Primal Blueprinter. Everyone has at least one area of their lives that needs improvement, one aspect that could be tightened up or dialed in a bit further. This book addresses those areas (and everything else). Several commenters and reviewers noted that very feature of it yesterday. Plus, it’s really the best, easiest and least expensive (at the time of publishing this post it’s only $13.77 on Amazon.com) response to someone interested in learning about the Primal way of life. Just hand ’em a copy of the book and be on your merry way. Mark, how is this different from the Primal Leap? Well, I’ve got good news and bad news. The bad news is that it doesn’t include the one-on-one support of the Primal Leap, and there’s no DVD, fancy three-ring binder or CDs. The good news is that it’s a whole lot cheaper than the Leap kit. Both products offer essentially the same thing – a step-by-step, day-by-day explicit explanation of the Primal transformation process – just with different audiences in mind. I created the Primal Leap because some folks simply need the multi-media input and direct, full, personal support to go along with the guidebook. It takes all the guesswork out of this stuff when you can get feedback directly from the source. OTOH, with The 21-Day Transformation I?m offering a distillation of all this great info for folks who want everything spelled out simply for minimal cost. The Primal Leap is first class (free premium booze, personal attendant, reclining seat) and The 21-Day Transformation is business class for next to nothing, but they both arrive at the same destination. And everyone gets to point and laugh at the suckers in coach eating the SAD. How is this different from The Primal Blueprint? The Primal Blueprint takes a broader, more philosophical perspective that requires the reader get deeper into the science, the evolution and the back-story before getting into the ?meat? of it. That works well for a LOT of people. For The 21-Day Transformation we took all the observations and questions we’d gathered from tens of thousands of user experiences through the PB, MDA and the MDA forum, Primal Leapers and PAST seminar attendees and then used that input to reframe the Primal experience for those who prefer to cut to the chase (?just give me the meat, Mark. Just tell me exactly what to do?). It’s a wholly new experience, with new insights, new clarifications on older ideas, and a ton of added value. Plus, it’s more visual and succinct than The Primal Blueprint, making it an easier, quicker read for folks who want to jump in right away. Most importantly, though, this book tells readers exactly what to do with less (but just enough) of the “why.” It doesn’t theorize; it cuts right to the bone and tells you what to do and how to do it. You call your seminar series the Primal Blueprint transformation. Any link between that and this book? Oh, definitely. Transformation (the book) effectively condenses Transformation (the seminar) into a print publication. It covers all the same material, plus more, and is designed to give you the direction you need to go Primal. If you’ve already been to one of my seminars, this book picks up where it (and my other books) left off. It will be a nice refresher course of the material, and if you aren’t able to make it to one, this book is a pretty good replacement for what you’re missing. If you’re worried about missing out on seeing my mug in person, I’ve conveniently placed plenty of photos of yours truly in strategic locations throughout the book, including on the cover (and yes, that’s my wife Carrie (age 55) running on the beach next to me). It’s not quite the same as being at the seminar, but it’s close enough. Sadly, I was unable to effectively replicate the lunch refreshments usually offered at our seminars. I advise nibbling on some jerky as you read. Mark, how can you call it a total body transformation in 21 days? You’re not going to lose all the weight you want in 21 days. You’re not going to replace most of your body fat with mostly lean mass in 21 days. You’re not going to reverse type 2 diabetes, get off all your meds (maybe some of ’em, though), and forever correct your skewed lipid numbers in just 21 days. But that’s not the point. The point of the 21 day period is to reprogram your genes to become an efficient fat burner, so that you can eventually lose all the weight you want, start to heal metabolic damage and arrive at your ideal body composition. It’s to effortlessly lose half a dozen pounds in a few weeks, when previously you’ve struggled to lose that many in four months, so that the road to getting lean suddenly opens up. 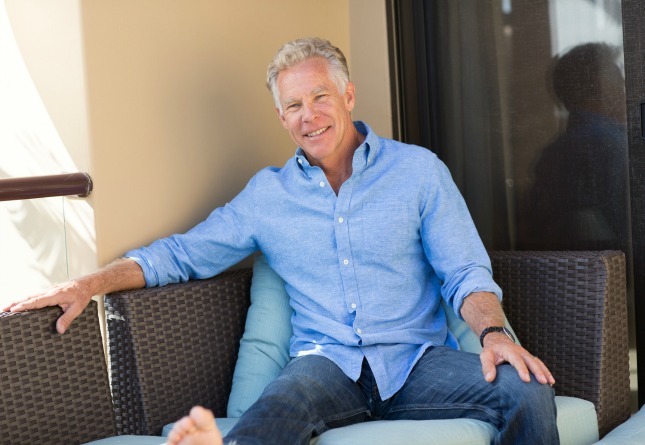 It’s to show you that it?s never too late to improve your health, that this “getting healthy, fit, lean, and happy” stuff isn’t that hard – or even unpleasant. It’s downright simple, intuitive, and pleasurable. At the end of the 21 days, you will have learned and experienced what you need to be and stay Primal for life. And once you have that locked in, all those “impossible” goals become possible. Heck, they become likely. The results will come, but first you have to lay the foundations by changing how your genes express themselves. The 21-Day Total Body Transformation gets your fat-burning gene-expression rolling. Mark, would this make a good gift for someone curious about the Primal lifestyle? Explaining Primal living to others can be tough. We tend to internalize all this information so that it becomes second nature. Many of us are Primal without even really trying anymore, so that when we have to explain it to a total beginner, we might miss some obvious stuff. We assume that everyone knows what oils to avoid, which products contain wheat, or why grass-fed butter is better than that weird white stuff that claims to be butter, because that information has been seamlessly integrated into our daily lives. It’s easy to forget that the general public uses a different framework for thinking about health and food. For those people, this book is perfect. It gives enough of the ?why? to satisfy the curious, and it provides all the ?what? and ?how? needed to actually live Primally. What does the Action Plan look like for the 21 days? But really, when you read the whole thing, I think you’ll agree that it’s written in such a way that you’ll be dropping it every other page to go do something, to clean out a pantry or practice squatting or recheck a food label you thought was OK. The action items are integrated into the text, because I think that’s the best way to get people responding to them. Ultimately, the entire book is about taking action. It’s about seizing control of your health, your weight, your fitness, and – in the end – your happiness. Mark, does the book help someone start the day they get the book? Yep. Its express purpose is to help people get started immediately. At the beginning of the book, there’s even a “Quick Start” guide that has everything you need to get going. At the end of the book, there’s a 21-day challenge course, where every single challenge you need to commence transformation is laid out. Right when you get the book, you can flip to the back, start with Day 1, and complete the Day 1 challenges. And from there, you’re off to the races. I know many health and fitness book publishers release their books at the beginning of January when people are making New Year?s resolutions. Why did you decide to release yours in October? This was actually a conscious decision. I figure there isn’t a better time to dial in your eating strategy and modern foraging skills than right before the holidays. So it’s a preemptive move. Instead of gaining weight during Thanksgiving and Christmas when Mom’s baked goods are wheeled out and Aunt Betty’s famous dips are center stage on the appetizer table, and then resolving to lose weight in the following months (but somehow never actually accomplishing it), I think a better strategy is to navigate the coming season with Primal skills and tactics in mind. Imagine foraging off the buffet table as much as you want (and you?ll learn what that means) during the holidays and losing weight! Imagine not dreading New Years, but looking forward to being even more fit on the first. I tried ordering 50 books on Amazon.com, but it looks like Amazon doesn’t allow you to buy more than 30 at a time. Do I need to place multiple orders or am I missing something? You can only add 30 books to your shopping cart from the main book page, but during checkout, on the final review page you have the option to change the quantity to a number larger than 30. I think I covered most of ’em, but if you have any further questions, don’t hesitate to leave them in the comment section. Let’s keep working toward our goal of reaching the New York Times best seller list, so that maybe by next year, you won’t be the only weirdos eating steak and egg yolks in the lunch room. Thanks, and Grok on! 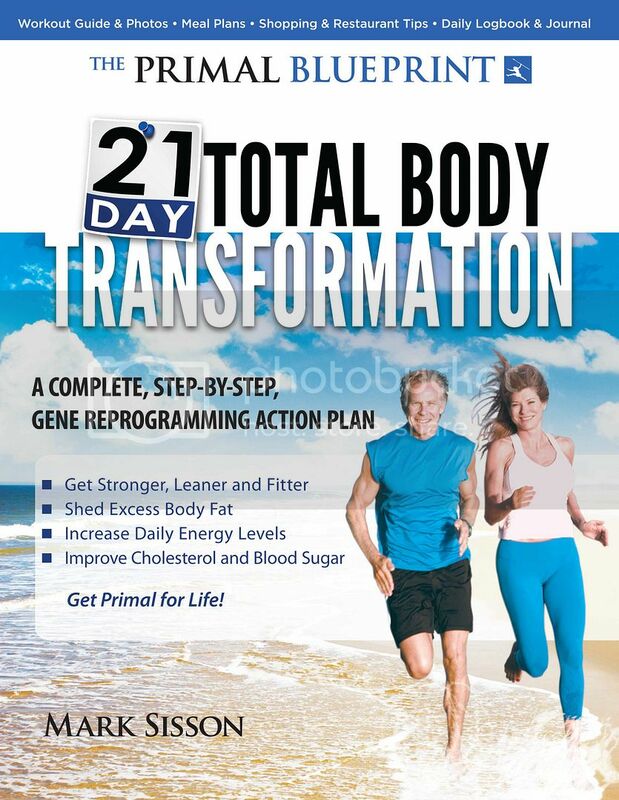 Grab your copy of The Primal Blueprint 21-Day Total Body Transformation by Oct. 24 and claim your free gifts. Learn more here. I am SUPER STOKED to see the amazon sales rank at #3 for this book right now… that’s simply incredible and I can’t wait to see it at #1! Oh No! You have just been overtaken by “Diary of a Wimpy Kid”. Lol. #4 is still pretty damn sweet. I can see it making it to #2 but, um… I don’t see you passing Steve Jobs. I had no idea a book was coming out about him in 5 days. I’m as positive as they come but there is no way you are passing Steve Jobs, lol. Wow – this is awesome, Mark! Congrats! This weirdo just ordered 3 books. We are on board. Will husband lower his blood pressure? Will I finally get regular exercise incorporated into my life? Will my friend get back on track? Will my daughter get her lean body back? Will the seductive candy kisses get kicked to the curb? Thanks Mark and crew for all you do. My heroes. It’s the Korg’s story all over again! Good Luck! Hey Mark love the new book! Love how you incorporated pictures of you and Carrie! !excellent excellent excellent!! In your book it said to rid of almond milk..so unsweetened vanilla almond milk is a no no? Flowerd, glad you love the book. Ordered my copy about half an hour ago and I should receive it on Friday (Amazon Prime — worth it for me!) Can’t wait! zomg what did we do before Amazon prime? WAIT for our purchases?? PSSSSSHHHH. Actually I’m bought it so I can see what a woman in her mid-fifties (Carrie) can look like with PB. It will inspire me. Whoever came up with the Prime idea is GENIUS. Getting my book today! I got my copy on the way. Too bad overseas orders don’t count towards the best-seller list. well that just sux!! Hats the point if having a “world wide web” if my book order doesnt count???!? silly. Btw, waiting impatiently for my copy to arrive!!!! Can’t wait to read it! I plan on gifting it for the holidays. Mark do you address the importance of sleep in the book and how to go about it? Erik, yes sleep is covered, though not to the extent it is the the PB. The idea here was to “cut to the chase”. Major emphasis on getting the diet and exercise right, so the other lifestyle tips are condensed – but still right to the point. My brother was struggling with insomnia and husband battling a form of hypersomnia (extreme sleepiness at any given point of any day) and both have improved so drastically since going Primal. Sleep is important, but the FOOD will help you sleep better. Our journey actually started when my husband’s sleep study doctor responded to my question with “well no, there’s nothing he can do in terms of diet and exercise to battle this, because he already lives a pretty healthy lifestyle.” They wanted him to basically take amphetamines daily, but we refused to accept that. In your face Dr. Whatshername! I hope so! My weakness … am using acupuncture now though (traditional 5 element Chinese medicine). We are going to buy this for my brother for a Christmas gift! I think its just what he needs to kick is health in high gear and kick his anxiety problems to the curb!! Thanks Mark! Well, would ya look at that…it’s beaten out the “The China Study and “Forks Over Knives”! I bought mine this morning. I just check my order on Amazon and see that the book is number 1 and the Kindle version is number 3. Way to go. Can’t wait for my copy to get here. Also great releasing it before the holidays because it’ll make a great gift! I have been prowling the boundaries of a primal lifestyle for 6 months now and can’t wait to sink my teeth into your new book Mark. Your timing is perfect too, we are just coming into summer in NZ and sheding those winter layers. P.S. Hey Mark, congratulations on the book, its very exciting. I have all your books, but I have a question, does your new book talk about putting on weight using Primal! THis is from the perspective off being healthy all your life, wasn’t eating grains, dairy etc because already new there is an intolerance with it before going primal, but loved the concept off primal, especially with exercise, implemented it, always have been lean but since being primal and eating extra fat into the diet, have put on weight around stomach area. Carbs are defiantly down and normally are under 50g, I am just interested because it would be great if it did talk about what could happen and how you can fix it. You are the guru and your views on this would be appreciated. I’ve read the PB and have been primal for over a month, with amazing results. Then my dad calls and asks, “what’s the name of that plan you’ve been on?” I replied, “let me send you something.”, which is the PB 21 Day Transformation. It’s perfect for him, and I can’t wait to hear back from him about how it’s going. I’m in a different category to a lot of primal people – I need to put on weight, about 15kg. I was diagnosed with crohn’s disease a few years ago and am currently having a flare, so my ability to absorb calories and nutrients, and as a consequence my weight, have all plummeted. I’ve recently bought the blueprint and am transitioning to a primal diet and lifestyle. Do you have recommendations for someone in my situation, and are they outlined in this book? Kate, this is all about arriving at your ideal body composition – whether that’s shedding fat or gaining muscle, or both. Much of what we discuss in the book is geared at training your body to burn fat efficiently. Once you can do that, adding muscle is a matter of sending the right signals to the genes that build muscle, and that’s where the high intensity training comes in. Do these simple exercises, eat enough protein and fat (and, yes, some healthy carbs, too) and you should eventually regain your health and an ideal body comp. Please keep us posted! Some company called The Best Book Source is already selling it for $40.59 plus shipping. Seriously dude? Why would anyone in their right mind order it from them at that price instead of from Amazon at the regular price. I was on the fence about ordering it. Great post, made me decide and I just emailed my receipt! Thanks. Another international order just made – it’s definitely going to be the Christmas present of choice for the ‘protesters’ in my life! I’ve had the book for over a week now, just keep going over it. I really like the way that it gets to the point and as always easily understood. Been primal since the beginning of the year nice to have a re-motivator on my desk. Thanks Mark keep up the good work. Having just finished the whole thing, I agree that it’s an entertaining and useful read for veteran primals, not just rookies. Mark’s given us a fun way to review our knowledge, polish up on some things we might have missed, and grab some new ideas for meals, workouts, and activities. Best of all, it will rekindle the flame of enthusiasm you felt when you first took the plunge. You will experience anew the adventure and romance of discovering the secrets of your ancestors. Enjoy! Been primal for 1.6 years now and had the Primal Blueprint. I am definitely getting this one, too, so maybe my husband can get a better understanding of what to do. just ordered one for me and one for my daughter. I can hardly wait, this should help me fine tune and introduce my daughter. I’m no good at explaining and I know that Mark will do a much better job. Anxiously awaiting my book. Last time I checked Amazon hadn’t even sent my “your order has shipped” mail 🙁 Hopefully soon. Is this something we can do for the 21 days, then start over and do it again? Or just 21 days and done? My daughter (17) and I will both be doing this. We both loved the 30-day challenge! BeccainSC, after 21 days, you’ll be all set to continue to do this for life without having to think about it or write anything down. Book arrived today…. and went immediately into my daughter’s hands! Hopefully I’ll be able to look at it soon. Love, Love, Love this book! I loved PB as well but this one is SO practical. I pretty much have my eating dialed in but have lacked the PBF piece, I walk, do yoga and lift light weights regularly but really wanted to get more into the functional body weight exercises…this book was WAY easier for me to understand than the PBF guide…Started with the 21 day challenge on Monday, did my first PEM workout today along with the assessment piece from the PBF guide…it was awesome! Having the two books was great, BTW. My personality works well with step-by-step plans so this book is an A+++++ with me! Does the 21 day challenge give you meal ideas or tell you what to eat each day? i bought the kindle version on account of it’s a bit easier tha wrestling with a hardcopy book. but i also bought a hard copy so i could pass it around to friends and family! going primal has helped me in ways i can’t even begin to describe so i’m alway excited to pass off a good book to friends and family i’ve already oaned out my copy of primal blueprint to a few friends and family and usually by the time they get through the first few chapters they end up ordering their own copy, and a cookbook or two! so stoked! thanks again, mark. keepup the great work! Thanks again Mark… cant wait! I bought some for gifts, but more excited to get working. I definitely needed a refresher! I’m also getting ready for a 2nd job and shoulder surgery, so i need to make sure I’m doing everything else right because i will be lacking in the sleep department…absolutely perfect timing right before the holidays! Ordered my copy last night, along with the Quick and Easy Meals cookbook (which qualified for the free shipping on Amazon….) Really looking forward to reading both books. Meal preparation and planning ahead are the main things likely to derail me, so I’m thinking these will both be helpful. Go Mark!!!! Thanks for everything you do for us. Looks like a great read. Any chance of an e-download version of the book. I’m in Saudi Arabia where English books, specifically health one are hard to find. If you want hard copy The Book Depository will ship it to you. Free shipping to Saudi. I just ordered mine from them as they have it in stock; whereas Amazon (here in the UK) have a 1 to 3 week wait before shipping. I’m one of those folks who think they don’t need the new book. I honestly believe I don’t. I adopted peleo/primal diet and lifestyle over a year ago. It works pretty well for me so far, I still have many questions and keep experimenting but I can easily find all the resources online for free. Having said that, I will buy the book and will read it. I’ll do so because: (1) I owe it to Mark for all the useful information I got from marksdailyapple.com (for free of course) and (2) I may still learn something new – I never rule this out. Would it be helpful for someone going from Zero Carb back to Paleo? I just downloaded the Kindle version on my iPad, so I can carry it with me everywhere, just like I do Primal Blueprint, and both cookbooks. I’ve stalled in my weight loss, so this ought to help get me going again. I wondered at the value of the book since I am pretty well dialed into the PB concept but my operating assumption is, generally, one cannot have too much data. This book is a good purchase. It re-introduced and reinforced some ideas, narrowing my focus a bit. I am going to implement some minor changes but the book also indicated I have been on the right track. One teeny, tiny, small-in-the-grand-scheme-of-things complaint: I have Barnes and Noble’s NOOK. Your new book 21-Day Total Body Transformation is fantastic and more practical, I bought it two days ago and pretty much finished it. I read PB and PB fitness, and living by them, one thing that I noticed, is that PEM in your new book does not include Overhead Press, what is the reason for this? I’m happy if it is that you find them redundant since I have always struggled getting past level 4 and cannot do a proper handstand (I lose balance). So have you scrapped Overhead Press or am I missing something? I downloaded your new book onto my nook and am reading it now (I already own the hardback of Primal Blueprint as well as the Comfort Food Cooking book as well). I was disappointed to find that to get the Primal Leap, I would have to spend another $197 for that. I believe in your philosophy and read your column almost daily, but I am probably done spending any more money. I bought the book and received your ten dollar coupon for goods. Thank you. I was going to buy a Grok On t in XXL, buy your out. When they coming in and will the coupon work if it’s after 11/30? Thank you. My book arrived today and I cannot wait to read it. I am really excited to get Primal. Its time for me to get off the high blood pressure pills and I threw my statins in the trash! I want to make this a lifestyle for sure. I love walking around in my bare feet. Thanks Mark for putting out this book! I’ve just ordered two copies: one for me, and one for my niece who is a food science teacher. I liked the rationale for releasing the book in October, and thought it made a lot of sense. Just don’t repeat the mistakes of earlier years over the holiday times. I’m not 100% convinced, but I’m going to commit 100% for the 21 days and see what happens! I’ve read all of your blog posts (and many I go back to again and again for their excellent information), as well as Primal Blueprint and the cookbook, and I have to say the 21 Day Total Body Transformation is excellent. The pictures and the success stories are satisfying to read. The writing style is so professional and upbeat. The organization of the book is clear and helpful. I can’t wait to pass it around to my friends and family. I think it will be easy for them to digest. Thanks for curating a large amount of information into such a digestible format!